CONSUMER CONFIDENCE - NOT SO FAST! 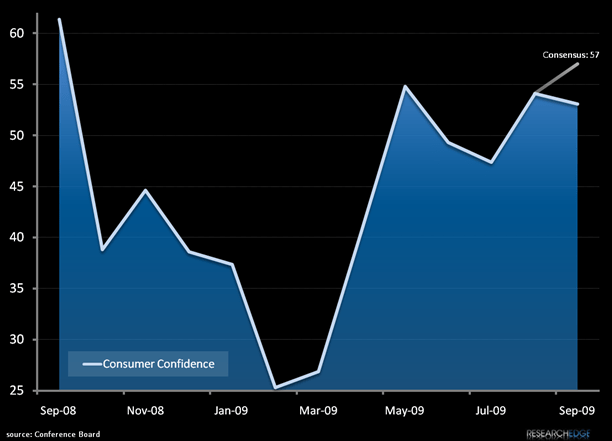 As we previewed yesterday, the Conference Board reported a disappointing consumer confidence number in September. The Index now stands at 53.1, down from 54.5 in August. The Present Situation Index decreased to 22.7 from 25.4. The Expectations Index declined to 73.3 from 73.8 last month. The consensus forecast reading of 57 had suggested another significant sequential improvement. The consensus optimism was based on higher stock prices, lower gas prices and fewer layoffs. Our call was that "while energy prices are less of a concern for most consumers today, more of them are focused on other factors such as employment, housing and credit concerns." More importantly, most consumer companies that have spoken publicly on the topic have stated that they do not believe that consumers are ready to buy into the economic recovery narrative. After falling to an all-time low in February, the overall index has been trending higher as more upbeat economic news helped improve the current situation, but we still have significant headwinds facing more and more consumers. In some respects, Q4 '09 is shaping up to mirror Q4 '08, when looking at consumer centric issues. I still believe that most consumers are focused on needs over wants, which remains in step with where we were a year ago. While more consumers are saving for future needs, a growing number of consumers are in precarious positions when it comes to personal finances. As such, more and more are placing a priority on paying down debt and focused on decreasing overall spending. It is these current consumer trends that leave me concerned that easy comparisons in 4Q09 may not translate into the improved YOY restaurant sales trends that so many investors are banking on. CONSUMER CONFIDENCE – NOT SO FAST!